string(1229) "Resource Centre > Uncategorized > Addressing Workers’ Rights in the Engineering and Construction Sector: Opportunities for Collaboration"
The construction industry relies on large numbers of low-skilled workers and, as such, is a major provider of formal employment opportunities around the world. In the Gulf States in particular, the construction boom has attracted millions of migrant workers, primarily from South and Southeast Asia, to work on large infrastructure projects. The nature of the industry and the scale of the projects in this region have generated specific challenges to workers’ rights and led to growing expectations from international stakeholders that large engineering and construction companies are keen to tackle. Over the past year, U.S. engineering firm CH2M and the Institute for Human Rights and Business co- organized a series of industry roundtables in London at which representatives from over 15 major engineering and construction companies, international civil society organizations, and high-levelgovernment officials discussed issues of workers’ rights in the sector, as well as the potential forincreased industry collaboration. Building on the momentum from these events, BSR’s research included interviews with select roundtable participants to investigate companies’ readiness for more formalizedcollaboration. The award of World Cup 2022 to Qatar and World Expo 2020 to Dubai have put the Gulf States’engineering and construction sector in the spotlight. In addition to intense media scrutiny, civil society organizations and other external stakeholders have set strong expectations on the different actors involved in building the infrastructure needed in the coming years. Many civil society organizations have highlighted the challenging conditions migrant construction workers face, particularly in the Gulf States. Recruitment practices in countries of origin place a heavy financial burden on workers, and debt incurred during the recruitment process and deception about the nature and remuneration of the work promised are often associated with forced labor and exploitation. Poor working conditions, long working hours, and delays in payment of wages frequently remain unreported because workers are too scared of losing their jobs to raise any grievances. Restrictive legislations on freedom of association and the right to collective bargaining further limit the possibility of workers to raise grievances and promote their collective interests. High temperatures and humidity levels in the Gulf States also expose migrant workers to heat stress, which constitutes a very serious health hazard. Finally, workers generally have no other choice than to live in the accommodations provided by their employer. Although this is slowly improving, there have been a number of reports highlighting the unsafe and squalid conditions in which migrant workers are housed. 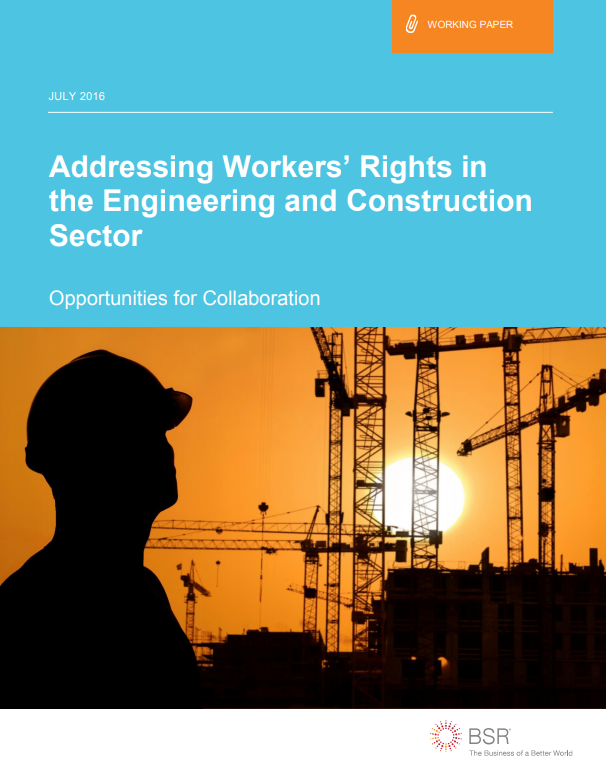 In a highly competitive environment, efforts by companies to implement commitments on workers’ rightsin their operations can be undermined, particularly when construction tenders focus primarily on costswith little or no mention of workers’ rights. In addition, companies operating in the Gulf States face a very restrictive legal environment. The short-term nature of construction projects also creates challenges by limiting the financial means to dedicate resources to managing workers’ rights issues or monitoringsubcontractors’ practices. In addition, these management structures and subsidiaries generally enjoy a high degree of autonomy in the management of their projects and subsidiaries will likely not seek orreceive much support or guidance on workers’ rights. Over the past 25 years, subcontracting hasincreased significantly to allow large engineering and construction companies at the top of the construction chain to concentrate on project management, rather than on physical work. As a result, largeinternational companies’ level of oversight on working conditions across a wide range of project scales and types is often limited, while subcontractors seek to minimize their costs, often at the expense of workers’ pay or living and working conditions.